An 11 oz. 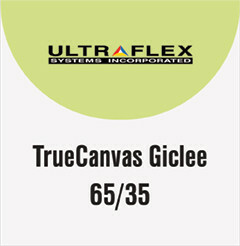 canvas composed of a 65/35 cotton/polyester blend with an acrylic-gesso top coat. The gesso coating may be folded and stretched without cracking. Designed to offer crisp detail and a rich tonal range. Available in a matte and gloss finish. Ideal for fine art reproduction as well as various art decor applications. Compatible with solvent, eco-solvent, UV and Latex inks.